4K. YUZHNY - SEPTEMBER 19: (TIMELAPSE) Cargo ship moving load at port at night time on September 26, 2013 in Yuzhny, Ukraine. Port in Yuzhny - one of the three largest ports of Ukraine by cargo. hd00:07YUZHNY - SEPTEMBER 19: (TIMELAPSE) Cargo ship moving load at port at night time on September 26, 2013 in Yuzhny, Ukraine. Port in Yuzhny - one of the three largest ports of Ukraine by cargo. 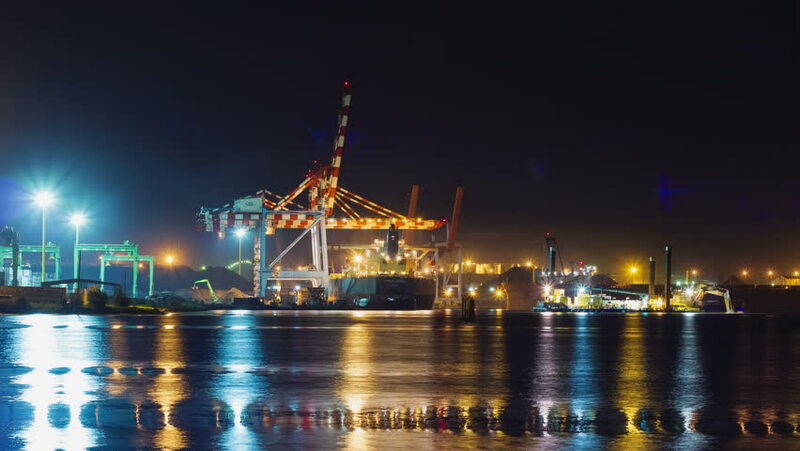 4k00:064K Timelapse Of Busy ShipYards and Docks At Night In The City. Workers, trucks, and cranes loading boats with cargo and supplies at night. hd00:20Container port terminal in Vancouver BC, Canada. hd00:18ISTANBUL - DECEMBER 21: Istanbul Container Harbour shot from the water side on night, December 21, 2010 in Istanbul. This particular terminal is main trading port in Turkey.